We are on the premises at all times and check on her frequently. Chances are if you see something, we are already aware of it. Bluff has been moved to our heated garage so that we can observe her during the night. 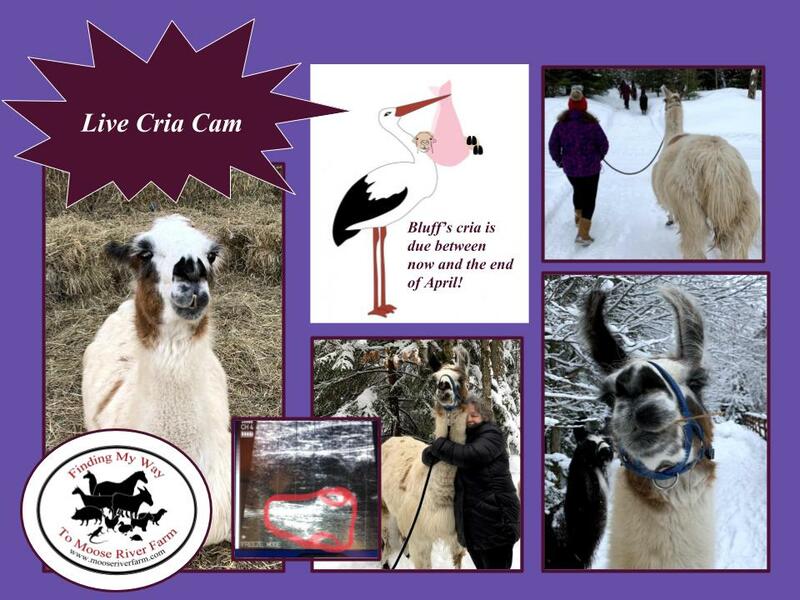 During the day, Bluff will be outside with the other llamas so don't be alarmed if she is not in view. We will summon our veterinarian only if and when we feel there is a need to do so. Bluff is not new to the birthing process having delivered 3 babies in the past. Therefore, we are expecting an uneventful delivery. Every effort has been made to make our mama llama comfortable and to reduce stress. We hope you enjoy the privilege of sharing this happy event with us and know that you are keeping fingers crossed so that all goes well for Bluff and her baby. Join a lighted procession of animals on Christmas Eve as they trek to the stable for a long winter's night rest. Horses, donkeys, llamas, goats, chickens, geese, ducks, dogs, tortoises and a pig share the peaceful space in which they live; much the same as they did during the miracle so long ago. Wishing you peace on earth. 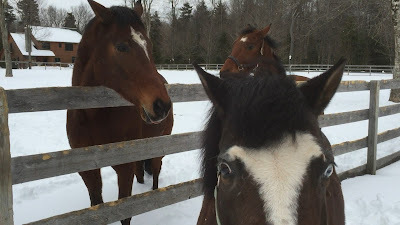 I am happy to announce that the manuscript for my second book; They Teach Without Words; The Animals of Moose River Farm is finally finished so that publication can occur early in the coming year. Excerpts from my latest animal memoir will appear on this blog in the coming weeks leading up to availability of the book. Having retired from teaching in June, I now spend more time among my animal family paying close attention to the nuances of their interactions with each other. As I reflect on almost thirty years of teaching it occurs to me that so many of the strategies and management skills that I brought to the classroom were influenced by my experiences with animals. They also played a key role in developing my philosophies about relationships, acceptance, patience and loss. This book is full of unforgettable four-legged characters from my house, barn and classroom, who inspired my love of teaching. To set the mood, this video introduces the animals with whom I currently share my life, as they go about their day in the barn. The following post shares the effect that the animals have on me during challenging times. Enjoy! Several years ago, my Aunt Anne’s memorial service was held at Gwynedd Meeting outside of Philadelphia. It had been more than thirty five years since I had attended meeting for worship. A familiar sense of calm settled upon me as I centered down in the early simple decor of the antique meeting house. Although the physical barrier of skin and skull prevented me from reading the thoughts of assembled friends and family, I was reunited with the connection that Quakers experience while waiting patiently for the inner spirit to stir. During the service, several vocal ministries interrupted the silence. I heard personal anecdotes that reminded me what a special woman and mother Aunt Anne was. Many delivered condolences to my cousins and dear Uncle Morrie. Others provided thoughtful messages of hope and community. Following meeting, we adjourned to the reception area. Nibbling on holiday treats, we received each other with embraces and smiles. After I exited the physical space of the meeting house, I remained enveloped for quite some time in the existential sanctuary of meeting for worship. 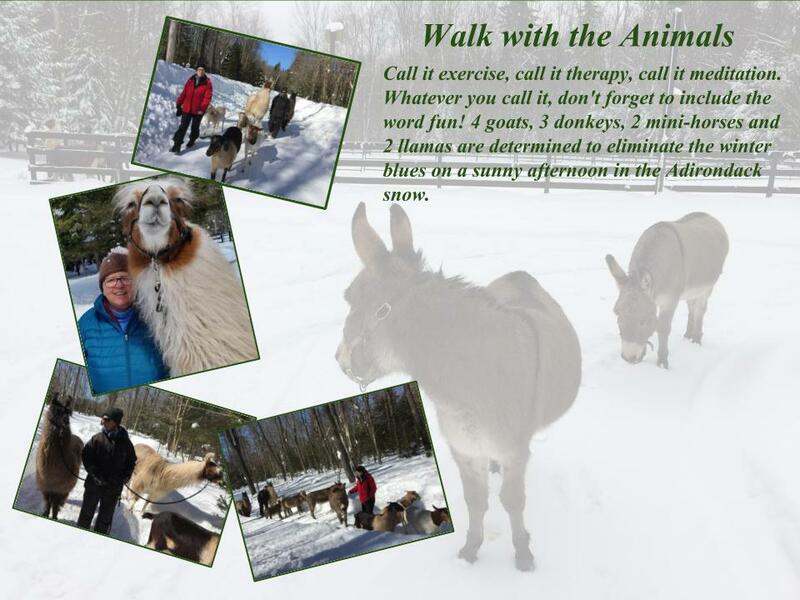 Eventually, I returned home to the routine of caring for animals that live with my husband, Rod and me on our farm in the Adirondacks. 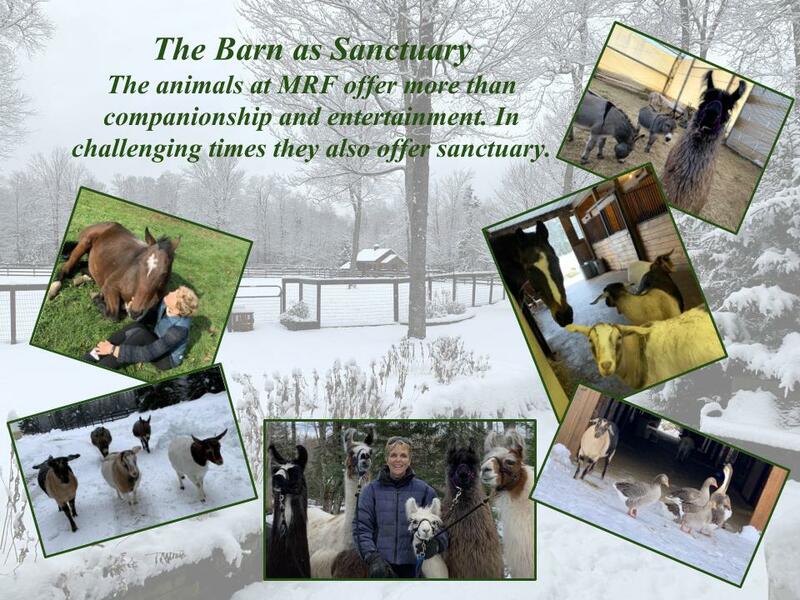 My barn is a sanctuary for animals and humans alike, providing shelter for the many horses, goats and donkeys who live with us on Moose River Farm. In the days that followed the memorial service, I came to realize that each morning I attend a different sort of meeting for worship. I don’t sit in quiet contemplation, yet I perform all of my routine chores in a state of meditation. Before centering down, I am greeted by a glorious cacophony as I enter the barn. Shrill whinnies, wheezy brays and ravenous bleats demand sustenance. I oblige by severing twine on hay bales. Once released, pungent grassy flakes pop, making it easy for me to grasp three at a time to toss into each stall. Urgent animal chatter transitions to a chorus of peaceful mastication. The grinding rhythm soothes me in the sanctuary that is my barn. Here in the pale dawn, I meet with my creature community to prepare for my day. Nothing elevates my spirit more. Although a formal meeting house is silent, this sanctuary is not. A harmony of grinding molars, pawing hooves and the occasional gusts of breaking wind mingle into white noise. The sounds assure that the animals are well. That reassurance gives me permission to center down to a deeper level of prayer. While my body is busy with chores, my mind meanders, searching for strength that will lift my troubled mood. Lowtchee, my portly black mare, chews her hay while I sift the piles of manure in her stall and toss them into a wheelbarrow. As if she and I are sitting next to each other on the wooden meeting house bench, I am aware of her satisfaction with life right now as she contemplates the forage in front of her. Once her stall is clean, I push my wheelbarrow to the next stall door. Joshua, a large paint gelding, swings his head to greet me as I enter. The black and white patches of his coat resemble formal evening wear. He too is content with his muzzle deep in hay. I allow my thoughts to surface long enough to greet him, stroking him between the eyes briefly before returning to deep meditation. How will I make a positive difference in a tumultuous world? My aunt’s funeral was held two days after the horrific shooting of children and teaching professionals at Sandy Hook Elementary School in Connecticut. The images are raw, the violence, personal. I am an elementary school teacher. 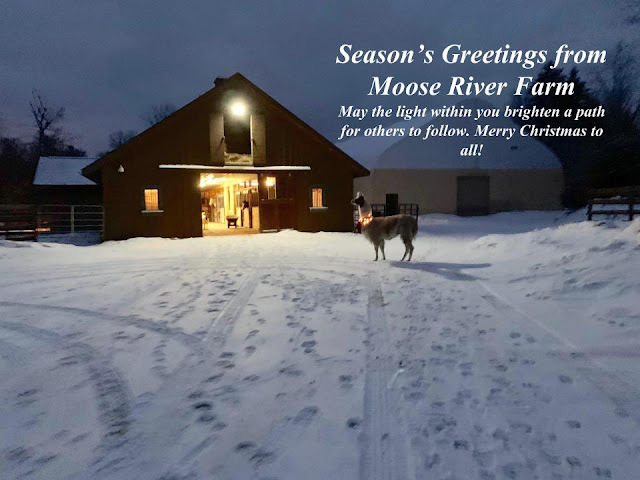 This morning I am comforted by the congregation of Moose River Farm’s meeting house. In our sanctuary we unite as community. They meditate on a level of gastric bliss. I do so on heartache. It takes the mucking of nine more stalls for my mind to transition from despair to hope. Along the way I desperately seek answers to difficult questions, mostly why. My Quaker education has instilled tolerance and acceptance. I can make a difference today if I make a concerted effort to provide my students with the tools they need to be successful balanced citizens in a world that strives to knock them off balance. My teaching is a small counterbalance to heinous acts, but it is within my control. In the end that is all we have, control over our own actions. Although my hoofed society of friends can’t articulate meaningful messages, it occurs to me that I have been meditating alongside of them for decades and have borne witness to their peaceful acceptance of what simply is, this moment, now. Happy New Year everybody. The Adirondacks are about to heat up after a very long brutally bitter cold stretch of sub-zero weather. These are the conditions that make me rethink why I live in an area where these temperatures are even a possibility. Tomorrow when I am basking in the glow of 15 degrees Fahrenheit above 0, I will have returned to my senses of course. 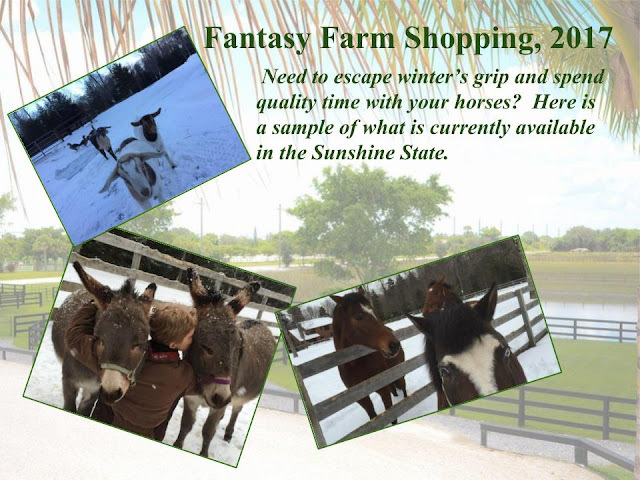 Until then let me share the latest offerings from Wellington, Florida, the winter horse capital of the world. Feast your eyes on properties that have more than you need and all that you want for a carefree equestrian lifestyle. Enjoy! $6,850,000 This is the bargain piece. 5 acres to design and plan all to your own specifications. Don't forget to include a place to hang the pitchforks, shovels and unsightly wheelbarrow out of view. $14,000,000 There aren't too many barn details for this one but since the mounting block is near the pool your horse will meet you there when you are ready to ride him. It's all good. $15,000,000 This is my personal favorite. I don't see a substantial house, but I do think there is a luxury apartment somewhere in the mix. Doesn't matter because the barn details are everything I imagine for luxury horse keeping. My fitness tracker might run out of memory after a few days of cleaning stalls and riding horses here. Hopefully updates and upgrades will keep my data accurate for awhile. $23,000,000 I like the idea that these 50 plus acres can be subdivided so that several of us can share the horse facilities; thinking along the lines of a coop. Let me know if you want in. $28,000,000 Just like the the next one only cheaper. Use the balance to improve the lives of those of us shivering up north. Maybe invite us to visit with our horses so we don't have to worry about finding caregivers for them while we are away. Besides, they would love a week of green grass on which to graze. We will even bring a bottle of wine or two as a house warming gift. Surely there is a wine cellar there..somewhere. $36,000,000 This is the masterpiece. Everything and more to pamper you and your horses while the rest of us layer our clothing for months on end. The only thing you will need to do is hire a HUGE staff to maintain everything. Don't worry, it will be worth it. Enough of Wellington dreaming. Truth is I am perfectly happy right here in the bitter cold and blowing snow. Just when I think I have had enough and can't take anymore, there will be a hint of warmer days to come and the magic and glory of spring will soothe once more. You can't have that experience without a few months of this. I know I don't want to miss the transformation this year...or ever. Stay warm.